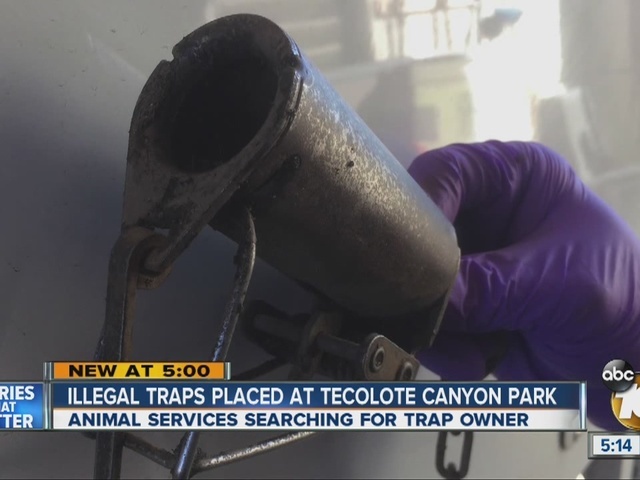 County Animal Services officials are warning the public after an illegal animal trap was found at a Clairemont park. Officials said Animal Control officers were called to Tecolote Canyon Park Wednesday after a raccoon was discovered stuck in a leg hold trap. According to Animal Services officials, the animal appeared to be in the trap for an extended period of time and suffered a broken leg. The raccoon was ultimately euthanized by Animal Services. Officials said the trap was "chained to a tree root and was well hidden with a rock and brush set over it." Officials are asking the public to be wary of these traps at local parks, especially at locations where children often play. Some nearby residents say gophers are a problem, but parents whose kids play in the area worry their kids could get hurt, especially baseball players at the field when they go for a ball. "A child loses a foot or hand his life is changed," Frank Tarantino said while practicing with his son Justin. David Mizer of Corky's Pest Control said it looks like a gopher trap and that it lacks a state mandated identification number. Corky's Pest Control uses cages, and Mizer explained, "They actually go in. We set up a can of food down here at this end and they actually step on this metal plate and it drops the door." Corky's checks traps every 24 hours as directed by the state so the animals do not die of hunger or thirst. According to Animal Services officials : "The use of a body-gripping trap on the raccoon is illegal under state law. In addition to setting an illegal trap, the person responsible could also face felony animal cruelty charges, punishable by imprisonment in state prison and a $20,000 fine." Anyone with information on this case is urged to contact Animal Services at 619-767-2675 or email dasinfo@sdcounty.ca.gov .